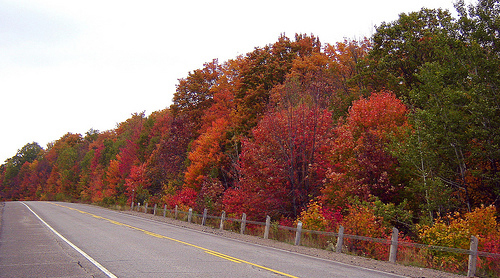 Best Canadian Fall Foliage Reports and Locations. Ontariotravel.net/publications/fallcolourrep… the Ontario tourism board publishes a detailed fall color report updated twice a week. These are the few Canadian resources I have found. If you know of others please let me know and I will add them to the list. I will make this a permanent page under Fall Foliage in a few days. Check back on my other fall foliage pages as I will update them as I become aware of more information. Is there any website I can check the foliage status report in Montreal and Mont Tremblant? I found the following resource: Call Tourisme Québec toll-free at 1-877-BONJOUR (266-5687) to enquire how foliage season is coming along. Wish there was a report to inform when the best time would be to plan a Nova Scotia fall foliage trip. Check out this site from http://www.novascotia.com/ from the Nova Scotia Tourism Agency. They post a leaf watch each year.